Engineering and Commercial Functions in Business focuses on the relationship of engineering and commercial functions in business, as well as business functions, types of business, and activities of engineers in organizations. The monograph first elaborates on organizations, structure of organizations, and business functions. Discussions focus on communication interfaces, functional area activities, authority, organization structure, structuring and organization, and engineering organizations. The text also ponders on financial factors, cost elements, and budgetary control. Topics cover budgets, cost audits, preparing budgets, flexible budgets, elements of manufacturing costs, direct material and overhead costs, operational costs, and financial factors. The manuscript takes a look at forecasting and inventory control, including uses of forecasting, opinion gathering, correlation with related variables, economic order quantities, and finished good stocks. 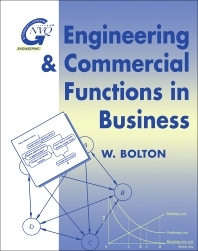 The text is a valuable source of information for researchers interested in engineering and commercial functions in business. 2.1 Why have a Structure? Former Lecturer at Buckingham Chilterns University College, High Wycombe, UK, and now retired, William Bolton has worked in industry and academia as a senior lecturer in a college of technology, a member of the Nuffield Advanced Physics team, an adviser to a British government aid project in Brazil on technical education, as a UNESCO consultant in Argentina and Thailand, and as Head of Research and Development at the Business and Technician Education Council. He has written many engineering textbooks, including Mechatronics, 4th ed., Engineering Science, 5th ed., Higher Engineering Science, 2nd ed., Mechanical Science, 3rd ed., and Instrumentation and Control Systems.